Colorado is our home. It’s where we work, and it’s where we play. And the kicker?? Our work is fun…and we love it! As Coloradans, we hold a few things to be sacred, and when you live as close to the Rocky Mountains as we do, one of those sacred things is skiing. And snowboarding. When the flurries start to fly in October and November, we’re getting our skis and boards turned, our edges sharpened, and we’re plotting out our first tracks and last calls. 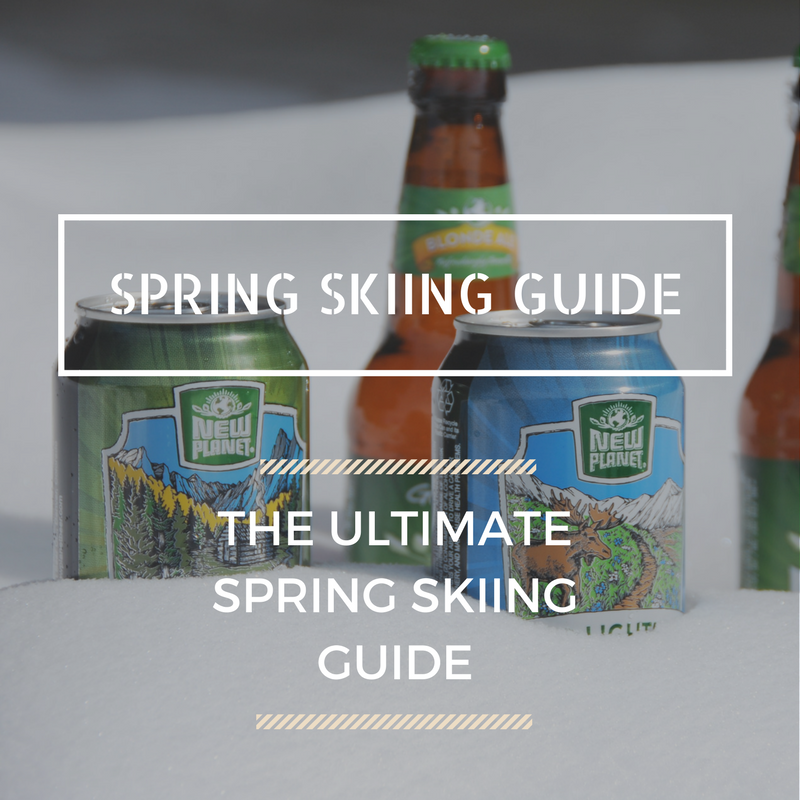 In honor of all of those who love to ski and ride, we’ve put together the New Planet Spring Skiing Guide. Complete with best places to enjoy your aprés and lesser-known secrets of the resorts, this guide is your Spring Skiing best friend! You read that right. Bring your own meat. As the days get a bit warmer and as spring storms continue to drop the fluffy white flakes, lunchtime on the slopes tend to be a bit more elaborate than the standard PB&J-on-the-lift that happens earlier in the season. Tucked away high up on Vail mountain are some free gas-powered grills for guests to enjoy. Two such grills are located on Parker’s Deck, just below Buffalo’s Lodge at the top of Lifts 4, 5, and 11. Offering spectacular views of the Vail Valley, Parker’s Deck is the perfect place to take a longer lunch. Whether you’re throwing on a few burgers and dogs or getting fancy with a steak that’s been marinating in your day pack since breakfast, these grills offer an excellent alternative to the pricey lodge meals and run-of-the-mill granola bars. Just be sure to bring your own utensils and clean up after yourself. Can we all just take a moment to appreciate A-Basin’s laid back culture and top-tier terrain? For those of you unfamiliar with this, Beach Day is any day at A-Basin. A section of the parking lot always has a tailgate-like atmosphere: people breaking out camping grills, canopy shades, outrageous costumes, drinks, and dogs running around. Oh, and skis. People make the trek to A-Basin early to stake their claim on the coveted spots between the Exhibition lift and Pallavicini (aka “Palli’) lift. Even though the lifts don’t usually open until 8:30 or 9am, you’ll see die hards lining up as early as 6am or 6:30am to kickstart the grills, crack a few beermosas, and get in line for first tracks. The atmosphere on any given Beach Day is spectacular and an absolute Must if you’ve never been. After a day of skiing, nothing is as rewarding as taking off those stiff boots, throwing on your sneakers, and sharing a cold one or clinking cocktail glasses with friends. Sore legs are ignored as you lounge by an outdoor firepit or watch the game with your new best friends. Ski towns are excellent hosts and know how to treat their goggle-tanned brethren when it comes to aprés ski options. The town of Breckenridge (Breck) is full of excellent restaurants and bars ready to cater to your every whim. One of our favorites is the Kenosha Steakhouse. With a great beer and cocktail list, their back patio is tough to beat on a warm spring day. Facing the mountain, keep your shades and beanie nearby, because this deck gets plenty of sunshine. Their nachos are killer and so are their steak cuts (duh). When in Vail, there are plenty of places you can grab that post-run drink or three. Because it’s Vail, you can cozy up to a hot toddy at the Four Seasons or hit up the basement bar, The Georges, in the Vail Village. Another great spot in the Vail Village is the Red Lion. Easily spotted by its bright red umbrellas, this joint has everything you may need to sate your thirst and appetite after a great day on the slopes. Small but mighty, Eldora Mountain is a quick 40 miles outside of Boulder, and it is the perfect place to take a few weekday runs before lunch. And whether you’re looking for a place to grab a beer during lunch or after a full day of skiing, look no further than the Timbers Tap Room. This cozy cabin feel has great beers, excellent bloody mary’s and isn’t huge, which gives it an intimate, comfortable vibe. And even though Eldora is only a short drive from us in Boulder, it still feels like you’re “getting away.” That’s why our go-to beer when we’re skiing the slopes at Eldora is Seclusion IPA. Conveniently packed in cans, this smooth IPA is the perfect pairing for a day on the slopes. Of course, Colorado is big and full of other mountains and haunts that we haven’t mentioned above…that’d take pages and pages! But we do hope that you find yourself somewhere up in the high country this spring, and if you’re not sure where to spend aprés, grab a six-pack of New Planet Beer and make your own aprés wherever you go. Drink and ski responsibly!